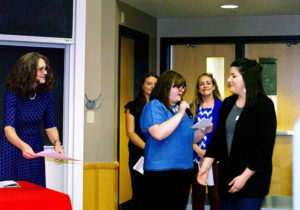 The GSFLC honored three people for mentoring, at the 2018 Awards Ceremony. The Graduate Student-Faculty Liaison Committee (GSFLC) offers three Mentor Awards each spring. This year, they went Professor Helen E. Blackwell, Matthew R. Dent, and Alyssa M. Love. UW-Madison Chemistry Department graduate students can nominate graduate students, post-docs, faculty, or academic staff who have served as a mentor. The awardees are given well-deserved recognition and a monetary award. The nominators write letters describing their mentor, including specific examples where the mentor has had an impact on their lives. The nominations are evaluated by the GSFLC based on involvement and effect of the mentor in personal and academic growth and traits that define the nominee as an effective mentor. Matthew R. Dent is a 4th year inorganic student in the Burstyn Lab in the UW-Madison Department of Chemistry. Matt was selected for this award because he was an indispensable resource to his mentees through his efforts in explaining concepts, demonstrating techniques, developing his mentees into independent scientists, proofreading application materials, and more. Matt’s mentees also said he was key to their decision to pursue graduate studies. “Matt takes pride in helping others!” said one of his mentees. Alyssa M. Love is a 5th year materials student in the Hermans Lab in the UW-Madison Department of Chemistry. Her commitment to mentoring is very apparent as she had the support of five nomination letters. Alyssa was selected for this award because she had an invaluable influence on her mentees’ careers through her willingness to listen, troubleshoot, offer support, help patiently, tailor her mentorship style to each mentee, share knowledge, and facilitate mentee growth. Alyssa’s mentees said they felt empowered to be more confident in their own work and abilities as a result of the mentorship they received from Alyssa.